Forward Jon Sims, left, of Dulaney High School shoots overtop of center Joe Jackson of Towson High School during a boy's basketball game in Towson, Maryland on December 18, 2013. 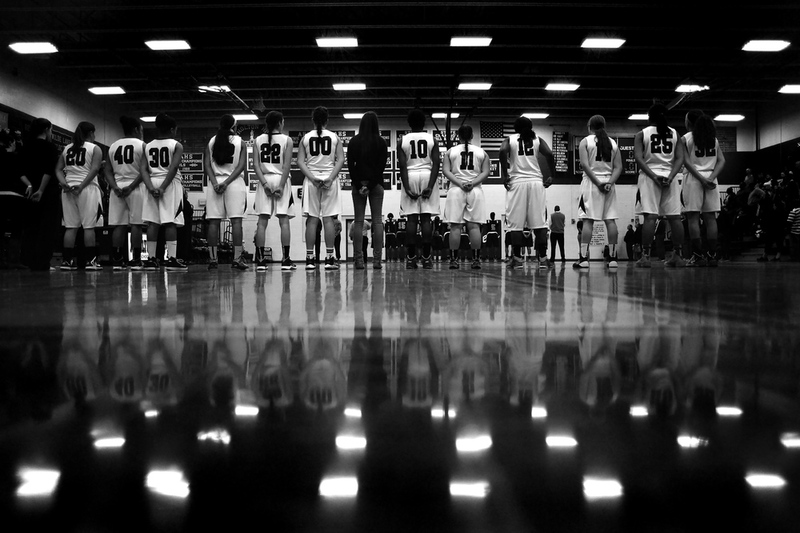 Atholton High School girl's basketball lines up for the national anthem before the start of the regional finals game in Columbia, Maryland on March 8, 2014. Chris Davis of the Baltimore Orioles prepares for an at bat on May 24, 2014 at Oriole Park at Camden Yards in Baltimore, Maryland. River Hill High School's Michael Beck walks off the mat after his match against Bel Air' High School's Brady Stafford, not pictured, during a regional dual on February 17, 2014 in Clarksville, Maryland. Reid Burch, 18, of Lutherville-Timonium, Maryland returns a serve with a forehand from opponent Blaise Schuster, not pictured, during the Columbia Junior Open tennis tournament in Columbia, Maryland on July 16, 2014. 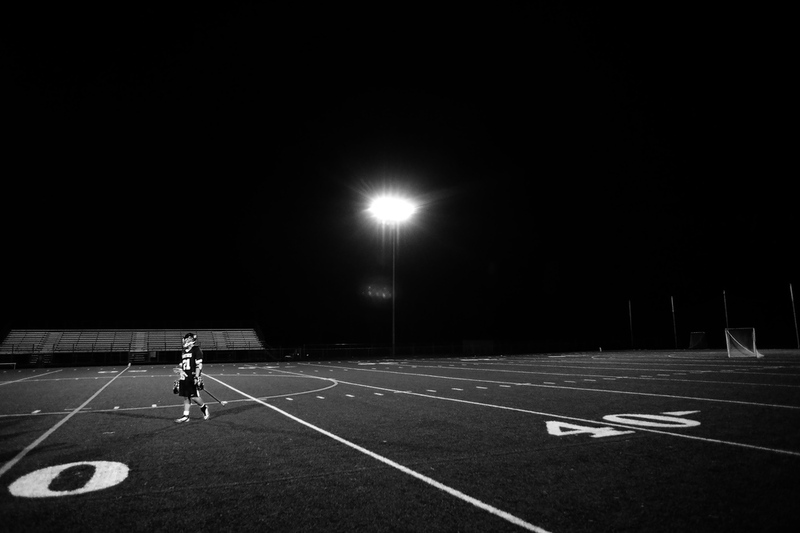 Jonathan Koh of Reservoir High School walks off the field after losing to Howard High School in a boy's lacrosse game in Columbia, Maryland on March 28, 2014. Daniel Lee, left, of Howard High School stares down Omar Delen of Marriotts Ridge High School during a 170-pound wrestling match in Marriottsville, Maryland on December 18, 2014. Chelsea Mitchell of Atholton High School watches on as her team tries to recover in the last few seconds of double overtime during a girl's basketball regional final in Columbia, Maryland on March 8, 2014. Gavin Rupprecht, bottom, of Bel Air High School continues to work against Nathan Dustin of River Hill High School during wrestling regional duals in Clarksville, Maryland on February 17, 2014. Leah Marshall, front, of Catonsville High School and Isabella Peterson of Hereford High School face-off during a lacrosse game at Catonsville High School in Catonsville, Md. on Tuesday, April 5, 2016. Anthony Valenza of Long Reach High School rests during halftime during a boy's lacrosse game against Wilde Lake High School on April 19, 2014 in Columbia, Maryland. Gregory Bisant of Mount Hebron High School collapses on the track after the 800 meter run during the second day of the Howard County Track Championships at Wilde Lake High School in Columbia, Maryland on May 6, 2014. Young Lee, left, of Glenelg High School and Jackson Courtney of Marriotts Ridge High School walk off of the green of hole 9 during the District V golf tournament in Columbia on October 20, 2014. Captains and referees watch the coin flip prior to a football game at Hammond High School in Columbia on October 18, 2014. Clare Duffy of Ellicott city prepares herself before the Arbutus 5K Spring Fling race in Arbutus, Maryland on April 5, 2014. Bennett Buch of Marriotts Ridge watches his shot during a golf match at Waverly Woods Golf Course in Marriottsville on Tuesday, August 25, 2015. Maddie Fields of Atholton High School tees off at hole 3 during a golf match between Atholton and Mt. Hebron at Hobbit's Glen Golf Course in Columbia, Maryland on August 21, 2014. Towson University Outfielder Dominic Fratantuono listens as the National Anthem is played on March 8, 2013 in Baltimore, Md. Towson Univesity recently announced they were planning on eliminating the baseball program for the following season. McDonogh sophomore Eleonore Evans, right of Ruxton plays against her trainer Lissen Tutrone at Meadow Mill Athletic Club. Evans who is currently ranked second in girls under 17 US Squash is training for US Junior Nationals, international play in Europe, World Junior US team and college. St. Pauls High School players (from left to right) Tre Hamer, Ryan Lee, and Iba Camara collide with fellow students after winning the MIAA B Conference Championship at UMBC RAC on Feb. 16, 2014. Members of the Landsdowne boys soccer dog piles on top of Jermaine Desoto after he scored the game winning goal in double overtime during a game against Overlea on Sept. 23, 2014 in Landsdowne, Maryland. Members of the Landsdowne High School boys soccer team celebrate after winning in double over time against Overlea High School on Sept. 23, 2014 in Landsdowne, Maryland. Catonsville High School forward Jennifer Nonn, right, reacts after losing to Walt Whitman High School during the 4A State Championship on Saturday, Nov. 16 at UMBC stadium. Brett Altenburg, second from left, of Mount Saint Joseph's celebrates with teammate Sam Sears after Sears scores during a boy's lacrosse game in Baltimore, Maryland on April 17, 2014. Kelly McPartland, left, of University of Maryland embraces her teammate Shanna Brady after defeating Syarcuse 15-12 in an NCAA championship lacrosse game Sunday, May 25, 2014, in Towson, Maryland. A participant of the 31st annual Columbia Triathlon at Centennial Park grabs his bike during the race in Ellicott City, Maryland on May 18, 2014. Eric Rosenberger of Oakland Mills High School misses a fly ball during a baseball game in Columbia, Maryland on April 22, 2015. Tyler Foster of Gilman dunks the ball during the championship game of the Bristow Holiday Tournament in Baltimore, Maryland on December 30, 2014. Camille Johnson, left, and Faith Leslie of Wilde Lake celebrate after defeating Reservoir during a regional playoff volleyball game in Columbia, Maryland on November 3, 2014. Quentin Brewer of Bethune-Cookman looks on during a men's basketball game at Morgan State University on Monday, Jan. 19, 2015. Brian Taylor of Catonsville High School looks up during a 160 pound wrestling match against Craig Worpell of Hereford High School in Catonsville, Maryland on January 27, 2015.